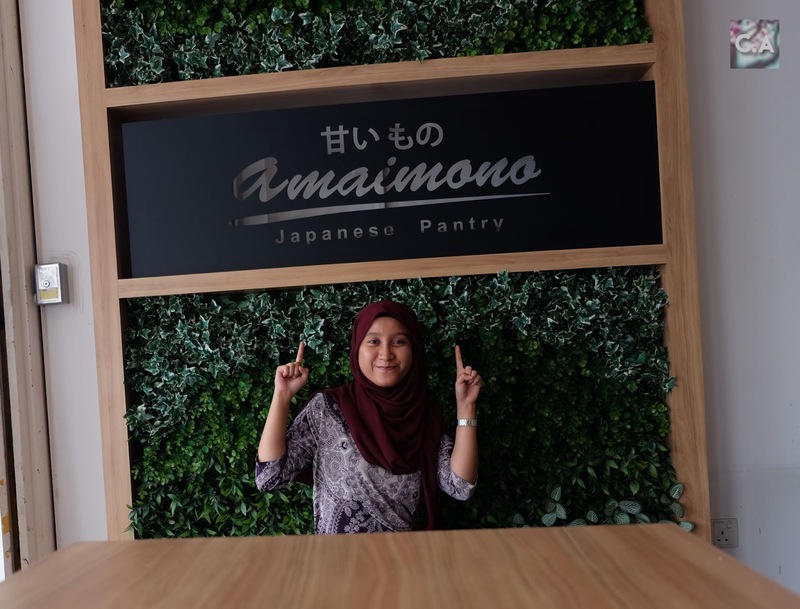 This cafe just opened on last 25 March and they came out with 'Pantry' concept because everything here is sold at affordable price due to self service practice. Based on my observation there is nothing over RM20 and I can confirmed you with that figure. I am really excited about so many things here and let's talk about the first one, interior design. I believe if you love to post picture on Instagram, this place cater to your needs. Starting from the entrance I feel welcome to this place. There is a also a book corner where you can enjoy your food and read at the same time. 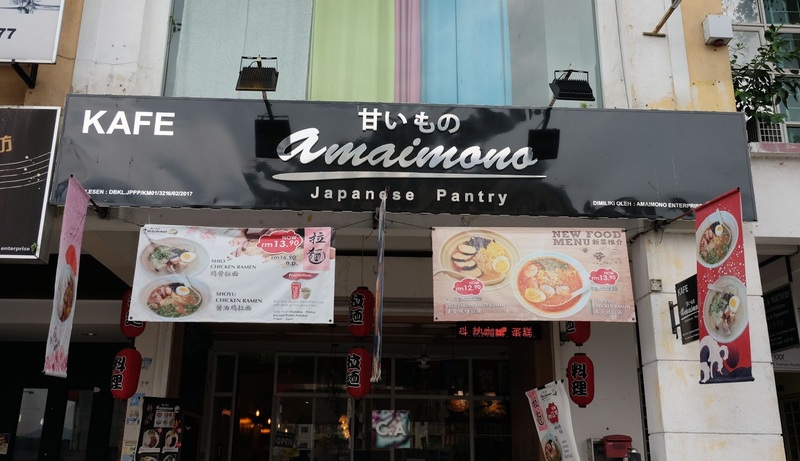 Amaimono cafe served so many foods such as chicken ramen, curry chicken rice, Melonpan ice cream and Taiyaki fish ice cream. If you want to know full menu details, click here. This place is a pork free cafe and their kitchen were handle by two Malay chef (mom and son team, Kak Faridah and Muhammad Faiz Najmi). During the food review session we were invited to see their kitchen personally. The best part is they showed us all the halal ingredients that they used from ramen to miso soup. Click here, to watch a tour video inside their kitchen! Fresh Japanese Ramen that they get from supplier. 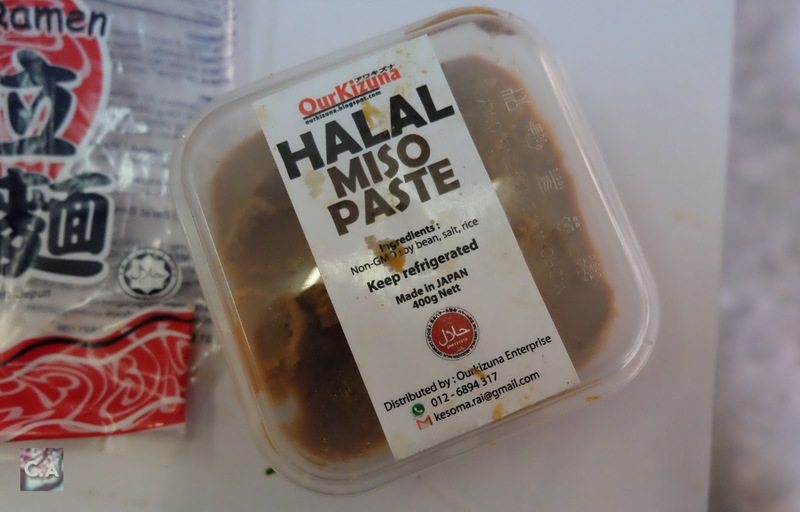 Halal Miso Soup distributed by Ourkizuna Enterprise. When this cafe started, they focus on the pastry and dessert first like handmade Melonpan and Taiyaki. They currently focus on Ramen and I heard in the future the cafe will add Gyoza and Udon to the menu. For me it was a complete set of Japanese street food. The owner itself have traveled all over Japan, meeting local food artisan of traditional ingredients. I heard that he traveled around 20 times in a year back and forth (Malaysia to Japan). Honestly, I can see his love and care about Japanese food from explanation given about it. The owner explained and recommend to us what should we eat here, at the cafe. 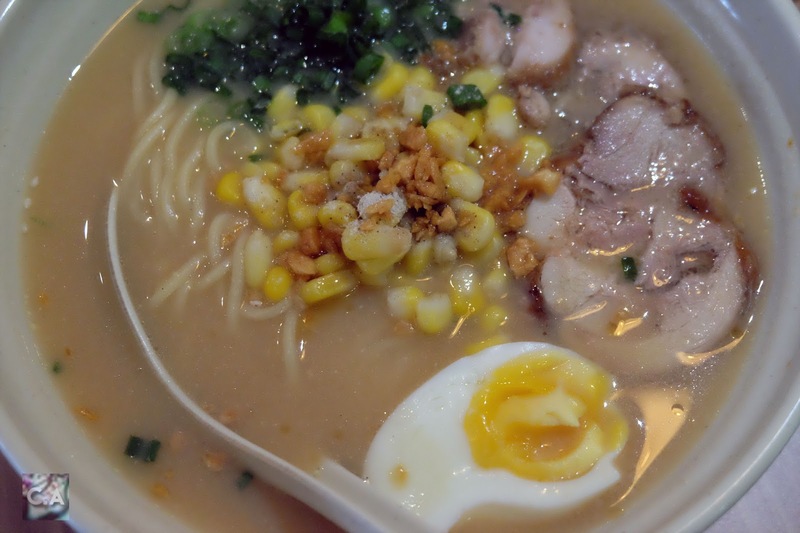 There are five types of ramen they sell here include shoyu and shio chicken ramen. It may be look the same in the picture but each of them have their own unique flavour, let's see what they have here for us. 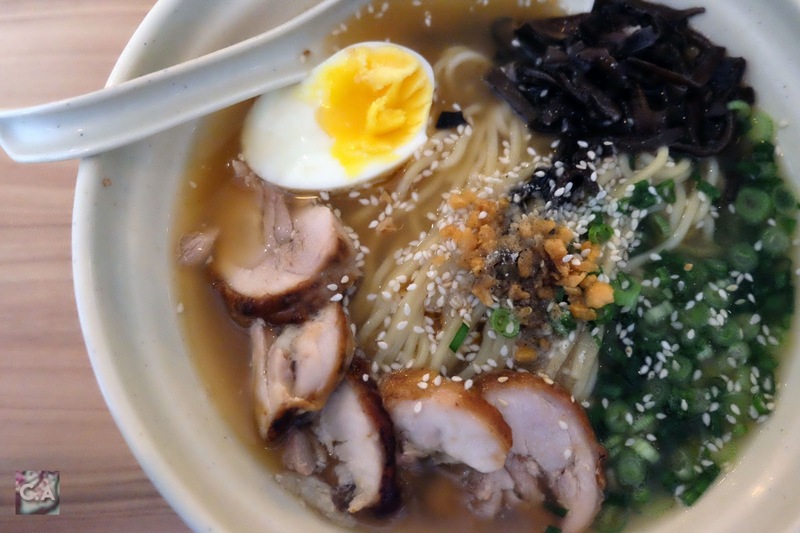 Between this five choices, the top selling are Shoyu and Tomyam Chicken Ramen. 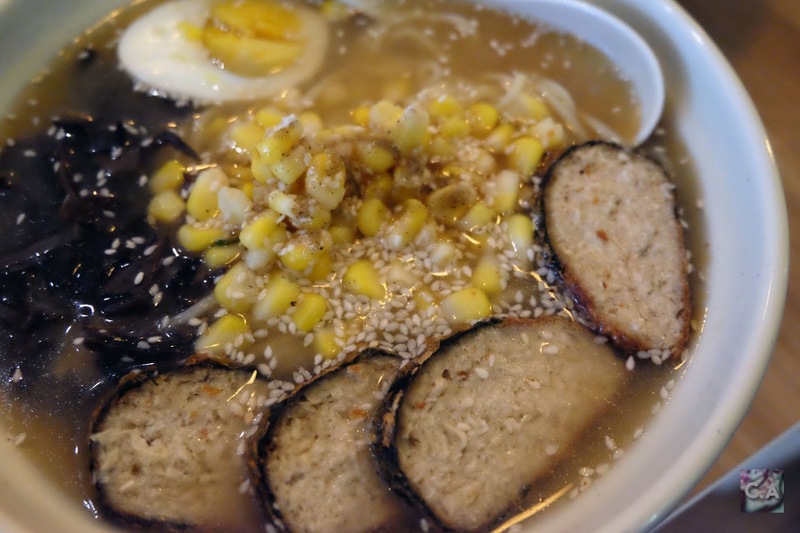 The latest one is the Vegetarian Miso Ramen which contain mushroom based broth which they made by themselves, corn, egg and tofu. 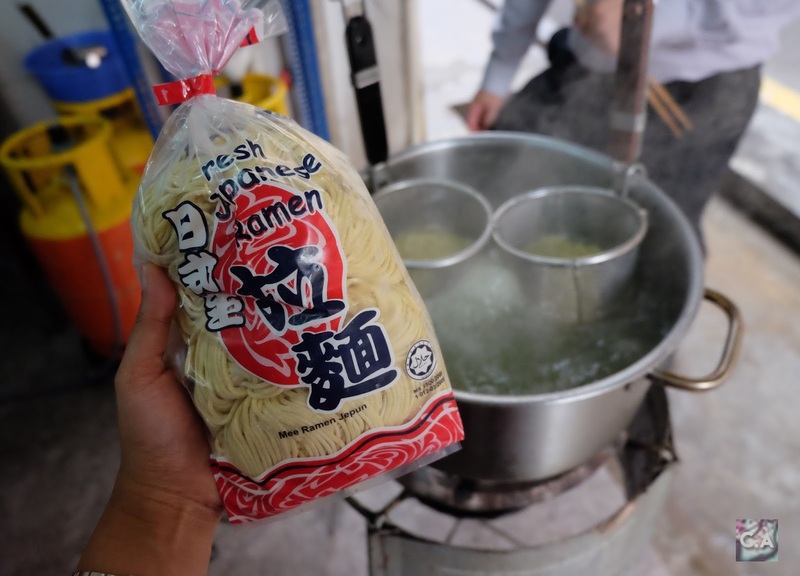 Each of ramen have their own unique flavour but from my personal view, I like the tomyam because of the spices, and between Shoyu and Shio, I prefer Shio better because it got that milky sweet taste to it. I easily starved by the ramen because the chef tell us how the broth was made. The broth is from a chicken drumstick bone and made fresh daily! If I'm not mistaken, every ramen dishes have miso paste inside it. 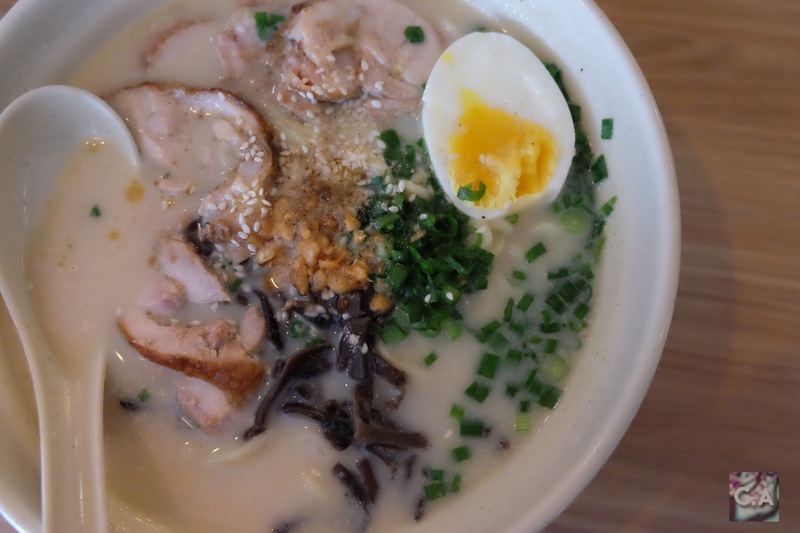 But if you want to taste the original miso make sure to order either Miso Chicken Ramen or Vegetarian Miso Ramen. 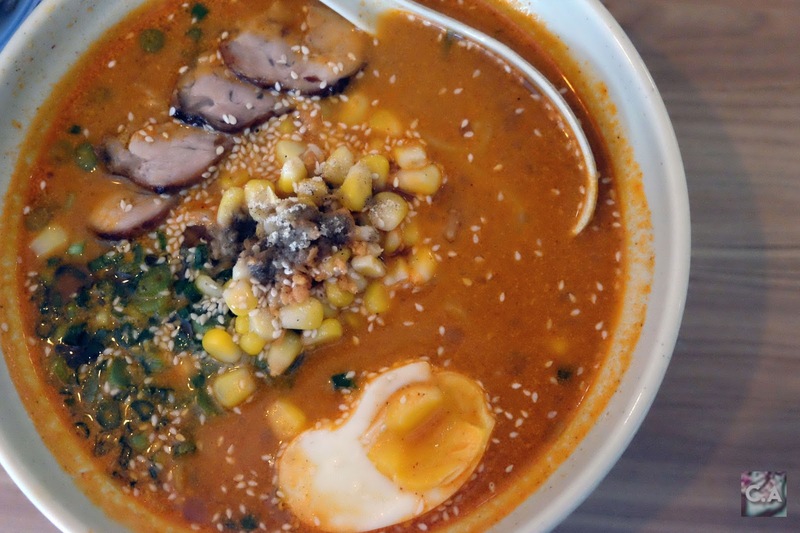 Fun fact: Miso Ramen is popular in Hokkaido! By the way, the amount of Ramen is pretty huge so if you don't want to eat rice, I think ramen is the best choice to make you full. If you want to eat a heavy meal they also sell rice, spaghetti and toast. 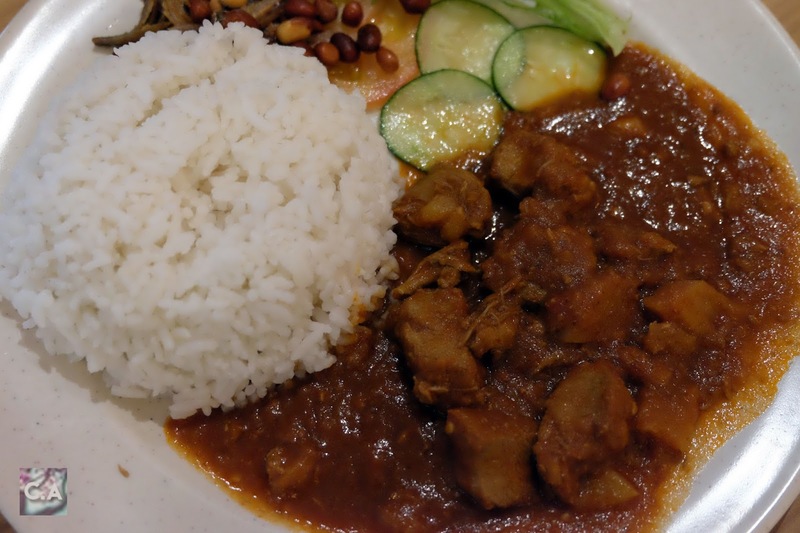 But during that day, we were served with four type of rice such as Japanese Curry Chicken Rice, Black Sauce Spicy Chicken, Nasi Ayam Rendang and Red Sauce Sour Spicy Chicken Rice. Well, let's give a fair shot to the rice menu shall we? 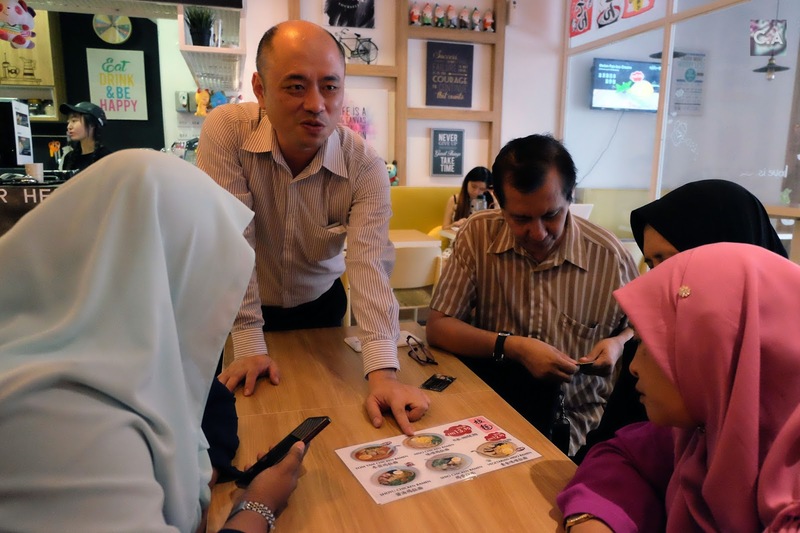 Beside this four choice, they also have two fried rice, spaghetti and honey Korean sweet toast on the same menu. Among this four, I like their Black Sauce Spicy Chicken personally because it got sweet taste to it. Im not sure why but during that day, sweet taste seems to capture my taste bud. 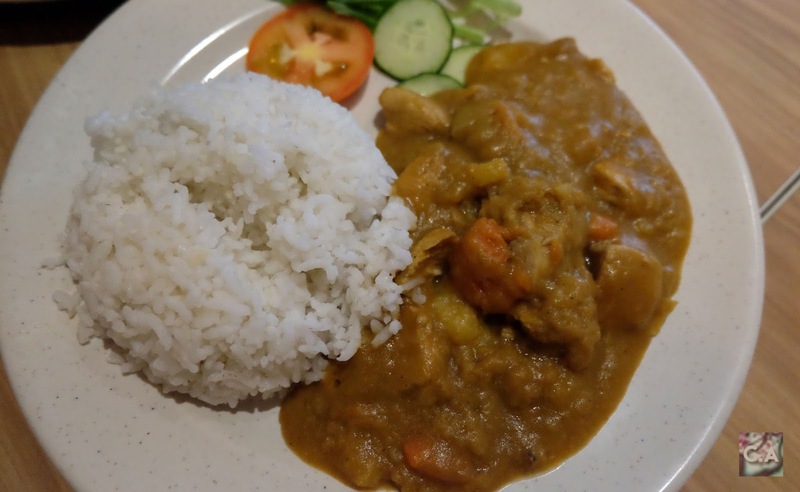 The Japanese curry was okay, but I advice you to eat it quickly because the sauce will get a bit thick once it cold and its not very appetising to look at. 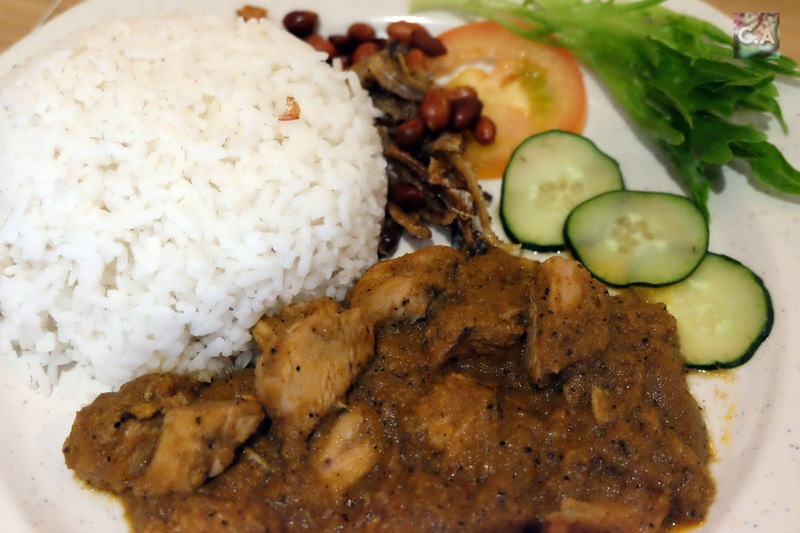 The other two Nasi Ayam Rendang and Red Sauce Sour Spicy Chicken Rice was regular to me, it doesn't have that va va voom factor to it. To add about this menu, every dishes for rice menu will get a salad, tomato and cucumber. 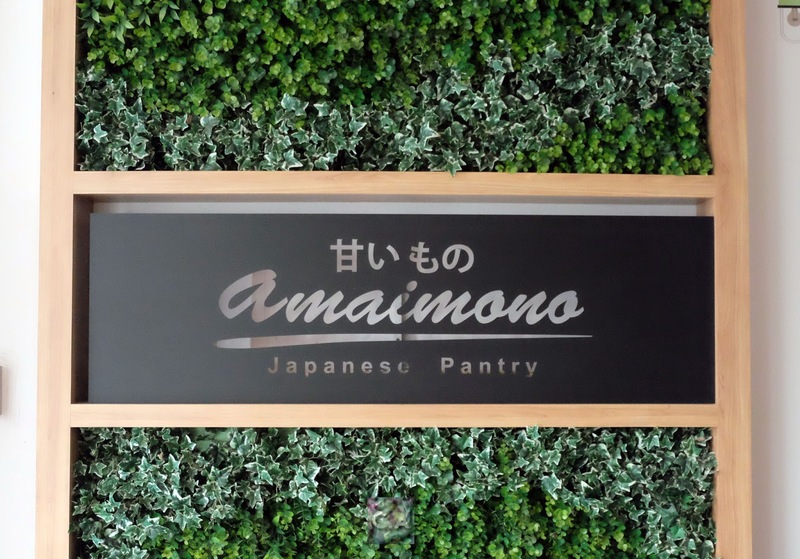 Amaimono Japanese Pantry starts with desserts and snacks first before came out with ramen and heavy dishes. I get to try their Taiyaki Fish Ice Cream and Melonpan Ice Cream. I am really excited for this two because I have it during my Japan Trip last few month so the authentic taste still stuck with me. 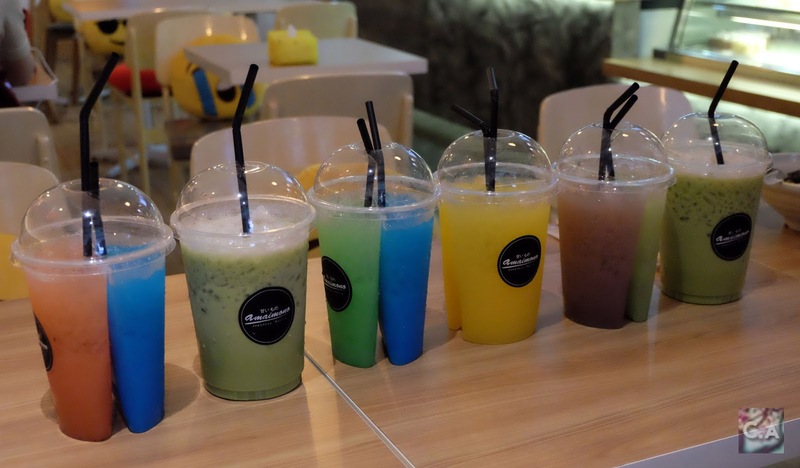 Colourful drinks range not more than RM10. Meaning of Amaimono itself is 'sweetie' or 'sweet things'. So they do have tremendous choices for desserts besides two items that I mentioned above. I ate Taiyaki before but instead of ice cream it was filled with red bean paste. It supposed to be very light, fluffy and crunchy at the same time. I was actually quite surprised because the Amaimono version is exact to it just a bit bigger. You can choose two flavour ice cream and also put extra toppings. 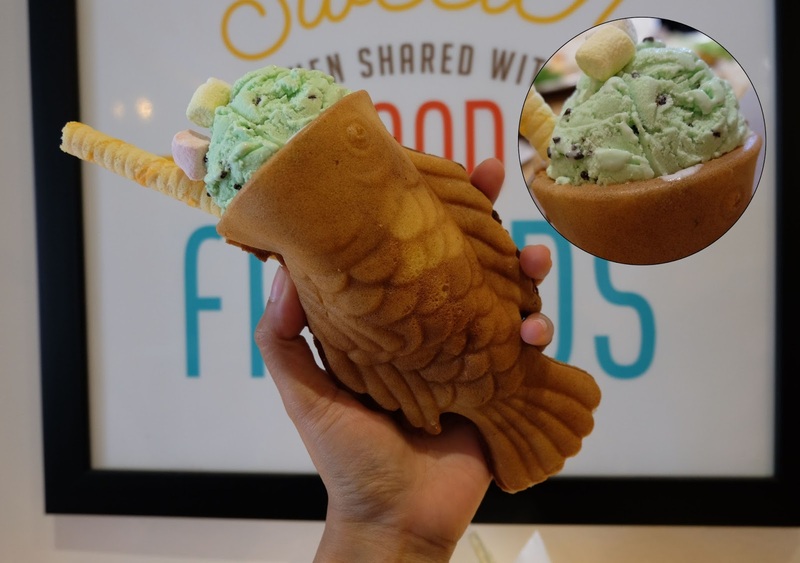 I got a cookies and cream and mint flavour, great combination but I'm more interested with the Taiyaki. So I ditched the ice cream and finished up the Taiyaki itself. For Melonpan, I am so lucky to get to taste it in Osaka while back and it supposed to be hard on the outside but fluffy on the inside. 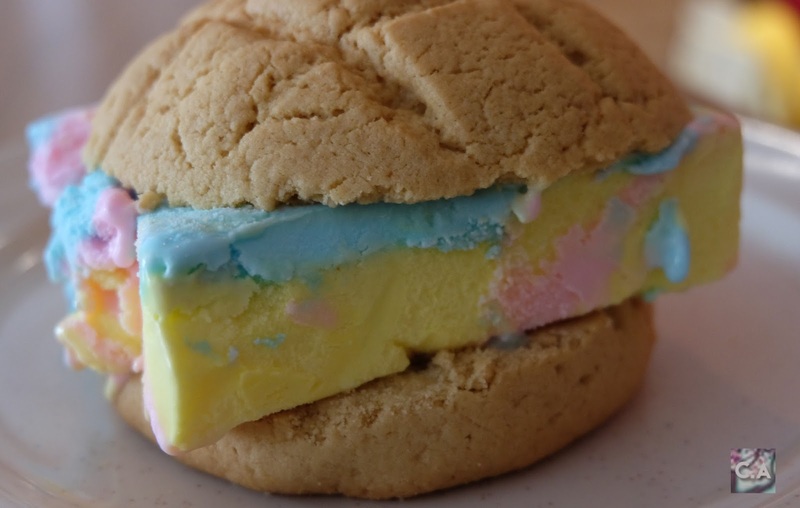 But, I don't quite favour the Amaimono version because it were more like a biscuit. I do hope they will keep on changing the recipe to get a breading and original taste like in Japan. Alright you have your dishes and desserts, it's time quench some thirst with big cup soda, yogurt juice and latte. As for the price, big cup soda is for RM7.60 without any toppings. Big cup yogurt juice is for RM 6.90 and big cup latte price for RM 7.90. They also served hot drinks. I have my drinks in green tea, I love how it was not too sweet and bitter at all. But, I do recommend you to get Blue Hawaii and Mango for yogurt juice. By the way, you can upgrade to couple cup for RM 8.90 only. Self timer at front of the cafe. 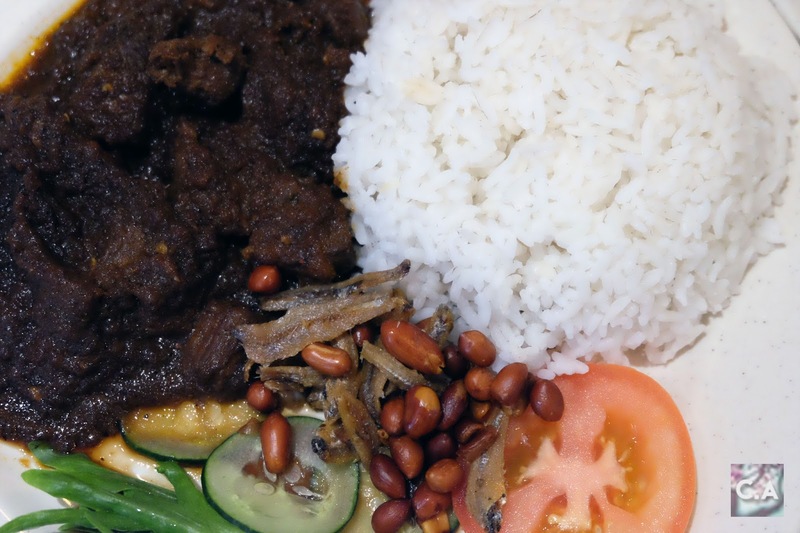 Address: 89, Jalan Rimbunan Raya 1, Laman Rimbunan, Kepong 52100 Kuala Lumpur. Front view of the cafe.